Immunohistochemical analysis of paraffin-embedded LNCaP cell pellets, either untreated (left) or LY294002-treated (middle) or NIH/3T3 cell pellets (right), using Phospho-Akt (Ser473) (D9E) Rabbit mAb, Akt (pan) (C67E7) Rabbit mAb, PTEN (D4.3) Rabbit mAb and Phospho-S6 Ribosomal Protein (Ser235/236) (D57.2.2E) Rabbit mAb. Cell pellets are provided in the SignalSlide® Akt Family IHC Controls. 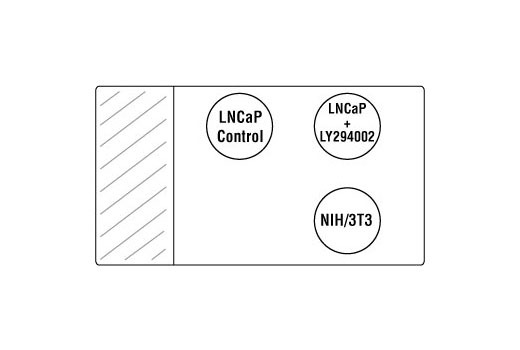 Schematic of placement of cell pellets on SignalSlide® Akt Family IHC Controls #8115. *SignalStain® Antibody Diluent is supplied as a working solution and should be stored at 4ºC (packaged separately). †Control slides should be stored at 4°C (packaged separately). The SignalStain® Akt Pathway IHC Sampler Kit from Cell Signaling Technology allows the researcher to examine paraffin-embedded tissues or cells with antibodies directed against proteins involved in Akt signaling. 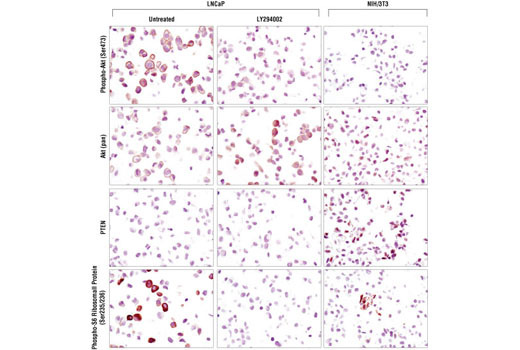 Multiple approaches are used to validate each antibody for use in immunohistochemical assays. Also included in the kit are control slides that can be used to verify the performance of each antibody and a primary antibody diluent. Please see the above table for the recommended antibody diluent for each kit antibody. Each antibody in the SignalStain® Akt Pathway IHC Sampler Kit detects endogenous levels of its target protein and does not cross-react with related proteins. Monoclonal antibody is produced by immunizing animals with synthetic phosphopeptides corresponding to residues surrounding the phosphorylation site(s) of interest, and synthetic peptides corresponding to the carboxy-terminal sequence of mouse Akt or from the carboxy-terminal sequence of human PTEN. The protein kinase Akt (also called PKB or Rac) is activated by insulin and growth and survival factors to function in a wortmannin-sensitive pathway involving PI3 kinase (1,2). Akt is activated by phospholipid binding and activation loop phosphorylation at Thr308 by PDK1 (3) and by carboxy terminal phosphorylation at Ser473 by the mTORC2 complex composed of mammalian target of rapamycin (mTOR) in a complex with rictor and Sin1 (4,5). Akt signaling is negatively regulated via the PTEN phosphatase (6). Akt’s several functions include inhibition of apoptosis (7-9), regulation of glycogen synthesis via GSK-3 (10), and promotion of the cell cycle (11). Akt also regulates protein synthesis by phosphorylating mTOR in a rapamycin-sensitive complex containing raptor (mTORC1) (12). Akt also effects mTOR activity via phosphorylation and inhibition of PRAS40 (40 kDa, proline-rich protein), which binds to raptor in the mTORC1 complex and inhibits mTOR activity (13). Phosphorylation of PRAS40 by Akt at Thr246 relieves PRAS40 inhibition of mTORC1 (14), allowing protein synthesis to occur. Active of mTORC1 signals to p70 S6 kinase, which in turn phosphorylates S6 ribosomal protein. Phosphorylation of S6 ribosomal protein correlates with an increase in translation of a subset of mRNA transcripts that encode ribosomal proteins, translation elongation factors as well as regulators of cell cycle progression (15). Important S6 ribosomal protein phosphorylation sites include Ser235, Ser236, Ser240 and Ser244 within a small carboxy-terminal region (16). Custom Ordering Details: The control slides that accompany this kit are cut freshly upon ordering. Please allow up to three business days for your product to be processed.